Ixia species are grown from half hardy bulbs. They have grass like leaves and stellar flowers of blue, purple, red or white. They come into bloom from spring into summer. Some of the common names for Ixia are Corn lily, African Iris, Wand flower, and African Corn lily. Ixia viridiflora photograph by Enez35. Ixia hybrid 'Buttercup' by FarOutFlora. Common Names: African Corn Lily, African Iris, Corn Lily, Wand flower, Turquoise Ixia. Life Cycle: Half hardy bulb. Flower Details: Blue, white, purple, red, pale green, orange, yellow. Spikes of 12 to 20 flowers. Star-shaped. Six petals. Growing Ixia Outside: Usually grown from Ixia bulbs as seed grown plants will not bear flowers for about three years. Bulbs: 4 inches (10 cm). Plant on a sand base. Spring in cooler areas; late autumn in warmer areas. Spacing 4 to 20 inches (10 to 50 cm). Seeds: Cover. Following the last frost. Sow Inside: Temperature: 60 to 65°F (16 to 18°C). Autumn. Grow indoors for two years then transplant outside in the spring in cool areas or the autumn in warm areas. Requirements and care: Full sunlight or partial shade. Good drainage. Rich soil. Regular watering during periods of growth. Winter mulch in warmer areas. Bring bulbs indoors and store in a cool dry place over the winter in cooler areas; replant in the spring. Propagate: by dividing corms when planting; will self seed successfully in dry areas. Miscellaneous: Attractive to bees and other insects such as monkey beetles. 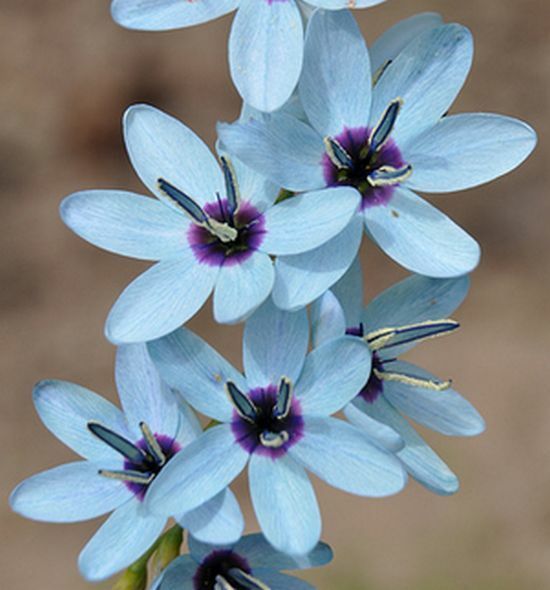 The name Ixia is named after the Greek name for bird droppings; a reference to the consistency of the plant’s sap. Corn lilies and other Ixia species are usually grown from corms; these should be planted on top of sand at a depth of 10 cm, and about 10 cm apart into a rich well drained soil. The corms can be planted in spring for flowers at the end of summer or at the beginning of winter for spring flowers. It is possible to grow Ixia from seed, though it may take more than three years for them to flower, simply cover the seed in soil after the last frost of spring. Ixia members can be grown in either sunny or partially shaded areas of the garden. 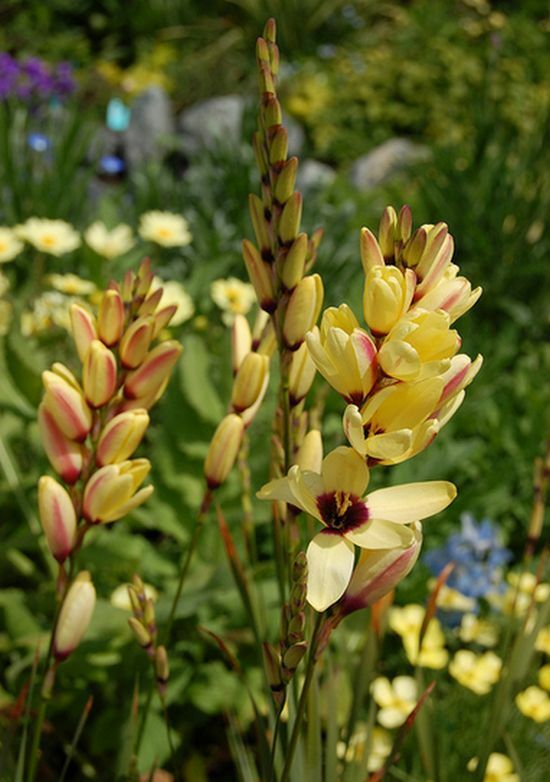 It is fairly easy to look after Corn Lily, African Iris, and other Ixia in the grden; they require regular watering whilst growing and flowering. In very cold areas bring the corms indoors and store in a dry place; replant in the spring. If you require more plants then the corms can be divided in the spring.